Mushrooms pair so well with spinach, and the addition of that extra lemon juice gives a bit of fragrance to the dish. Besides being delicious, this dish comes together easily so you can make it part of your weekday meal rotation. This is a terrific meal for after work or after school cooking. 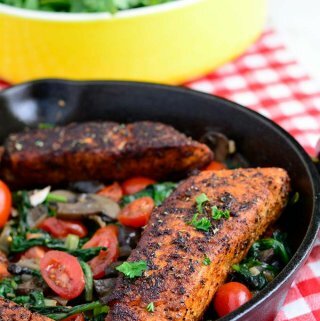 The simplest extra virgin Olive Oil, Salt, and pepper provide a great flavor for the Spinach and mushrooms while the delightful combination of herbs and spices makes this simple Salmon Fish standout. I love to use Portabella mushrooms or the white mushrooms for this. The only difference between portabella and white mushrooms is just their age. White mushrooms are younger and portabella has been allowed to mature. However, you can use any type of mushroom of your choice or a combination of different kinds of mushrooms. 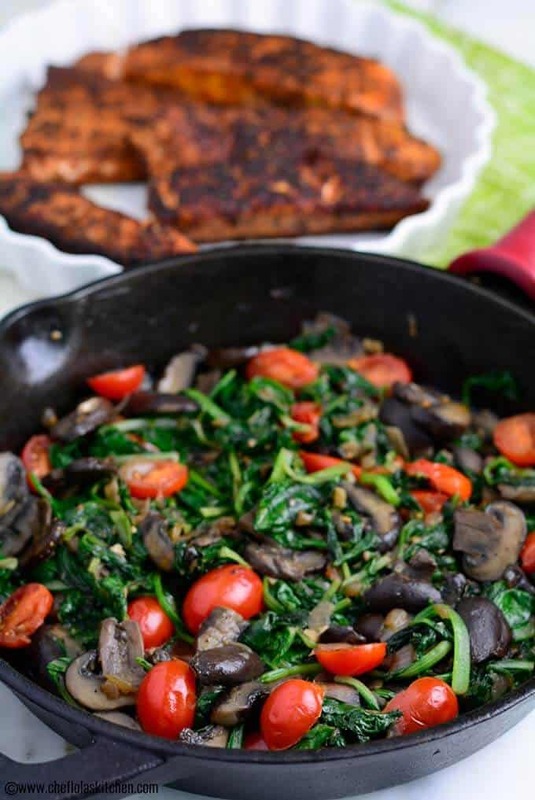 Although this sauteed Spinach and mushrooms are delicious unadorned, grape tomatoes are a good addition. It will not only brighten the face of the meal, but it will also add a bit of sweet bite to compliment this nice savory dish. 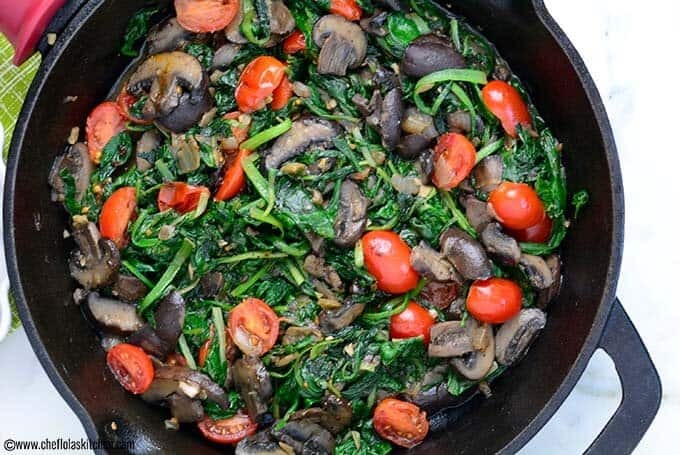 To make the Sauteed Spinach and Mushrooms start by making a simple onion and garlic flavored olive oil then you add the mushrooms when the mushrooms are cooked in this little flavored fat, they release their juices, and an earthy broth is formed. Once all the liquid is almost evaporated, you season with salt and pepper and gradually add the Spinach and cook until just wilted. To make the blackened Salmon, the fish is first rubbed with fat like butter or oil. In this recipe, I used Olive Oil. The Fish is now dredged in a mixture of spices. The fish is then fried in a hot skillet. The characteristic brown-black color is as a result of the charred spices. 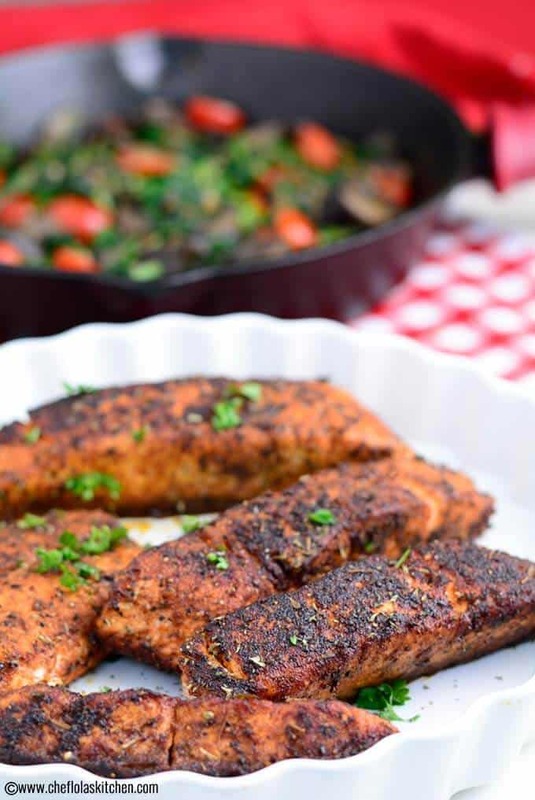 The dry rub used for making this blackened Salmon is very versatile, it has an affinity for not just Salmon but for other meaty fish like Swordfish, Tuna. It’s also good with Pork. I have also tried it on Chicken, and it turned out amazing. So you might want to double or triple the rub so that you can store it for future use. **Store it in a tightly sealed jar away from light for up to 3 months. I stay away from coconut oil when making this recipe because it tends to release so much moisture and that delays the blackening of the fish (one of my favorite oil for cooking and frying). With all my experiments with different oils, I have come to settle with Olive oil. Also, a combination of butter and Olive Oil or any vegetable oil will work just fine. Be careful not to overcook the spinach; otherwise, it will turn brown. It’s okay to remove the skin is you are not a fan, but I keep it on because it’s just as beneficial as the other parts of the fish. 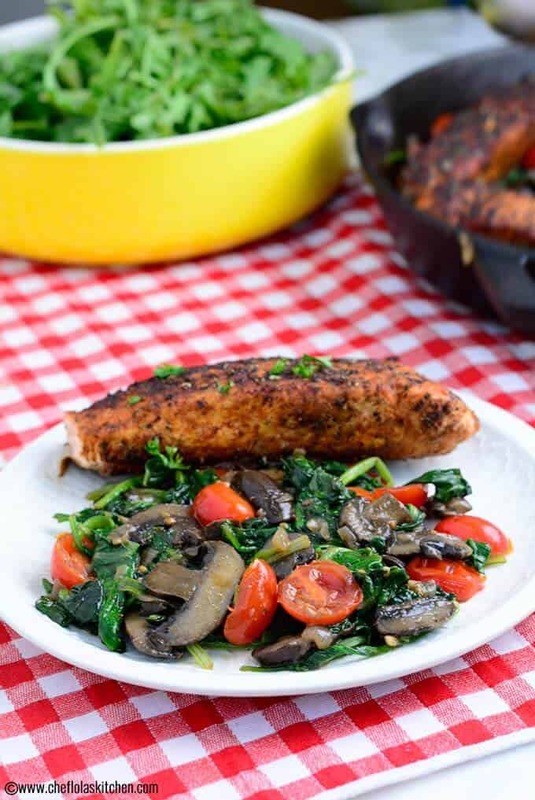 A simple but elegant dish which features sauteed spinach with mushrooms and salmon. This meal astonishingly satisfying and healthy. It will leave you feeling nice and light. Combine all the dry ingredients together in a bowl mix well and set aside. Clean the fish and pat dry with a paper towel. Preheat the remaining olive oil in the skillet or a non-stick pan and place the seasoned Fish inside the skillet. Fry for 10 minutes – five minutes on both sides on a medium to high heat. Brush any dirt off the mushrooms with a soft brush or a damp paper towel or rinse quickly and pat dry with a paper towel. Cut the Mushrooms lengthwise to make bite-sized pieces and set aside. Preheat the Oil in the skillet. Add the Onions and Garlic and cook till onions become soft. about 3 to 4 minutes. Add the Mushrooms. Cover and simmer until they become tender. About 10 minutes – a little more or less. Season with Salt and pepper then add the Spinach in bits until just wilted and stir in the lemon juice. 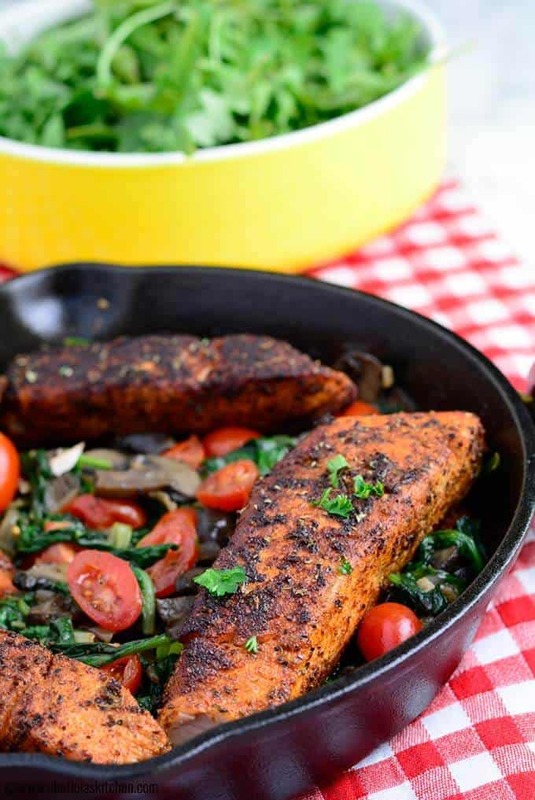 Plate the Sauteed Spinach and Mushrooms with the Blackened Salmon and enjoy!